For 100 years, the university’s massive middle initial has provided a symbol and a destination for students. The lighting of the Y began not long after the letter was completed, and a club called the Golden Y Boys was organized to oversee it. In 1941 the Boys became the Gold Y Chapter of the Intercollegiate Knights, a national service and honor society based on the old King Arthur legends. When I arrived on campus in 1978, the tradition had changed little. As part of their initiation to knighthood, “pages” would get together Friday night before the Homecoming game, rip stuffing out of a couple of D.I.-reject mattresses and lovingly hand-mix the stuffing with used motor oil until the “pagemaster” declared it “gook.” After the Homecoming activities, the pages, armed with buckets of gook, torches, gasoline, shovels, and a fire extinguisher, trekked up the trail to prepare. Pages would form fist-sized gookballs and lay them out around the Y. Two groups of pages started at the crux of the Y, where the arms meet the trunk. One page stuck a thumb into the gookball; another filled the thumbprint with gas, since gookballs weren’t too flammable on their own; a third touched the torch to the ball, lighting it. All went well—most of the time. The knights who accompanied the pages occasionally had to fight a small brush fire or reprimand a pagemaster who started at the base instead of the crux. This meant there would be 10–12 minutes when the lit gookballs formed a U, not a Y. We would then sit in the middle of that flaming symbol of Cougar pride, relating our school and fraternal traditions and making new ones. Finally the time came to stomp out the gookballs and pack out our trash. As things occasionally do, the tradition has evolved. Some alumni picked up the tab and Physical Plant picked up some light bulbs and a generator. But, just as they have for most of the 100 years that the Y has stood watch over campus, the knights still hike the mountain to light up the night. When I came to BYU, I lived about eight blocks from the base of Y Mountain. After classes, I would grab my Walkman, some snacks, and my backpack full of books and trek to the Y, where, usually in solitude, I could enjoy the view, study, write in my journal, or just sit and think. I loved the peace of the mountain so much that I accomplished my goal of climbing to the Y every month of the year. In our 20 years of marriage, we have climbed the Y many times together and with our three children. To us the Y stands not only for BYU but also for yes. By Melissa Dickson Ricks (BS ’04), Auburn, Wash. The summer before my freshman year at BYU, I was full of big plans. Those plans seemed to disappear, however, the moment my family left me in my tiny Heritage Halls apartment. I wondered if I could really survive 800 miles away from home, if I’d have anything to say to the stranger sleeping just feet from me, what the MARB was, and how I was supposed to find it. Throughout those first months at school, I continued to struggle with homesickness. As October rolled around, I found myself hiking with a group of people to light the Y for Homecoming. When we got there, two boys got the bright idea to lie upside down. After doing it themselves, they convinced me to try. Wanting to make a good impression, I scooted myself into position. They each held a foot, and I slowly lay down. After getting over the feeling that I was going to slide headfirst down the mountain, I took in the view. The city lights appeared to be the sky, and the sky looked like the ground. Thanks to some amazing roommates, great classes, and incredible friends, my view of school also flipped upside down. Instead of focusing on home, I began to realize how many great things were going on at school and went on to enjoy four great years. For me, the Y is an affectionate reminder that when life isn’t going as planned, sometimes I need to turn my view upside down. By Michelle Gygi Morgan (BS ’95), St. Louis, Mo. As a child growing up in Orem, Utah, the giant Y on the mountainside seemed like one of the wonders of the world. I loved seeing it as we would drive around town, and I felt lucky that we could even see it from our house. My most memorable trip to the Y was with part of my family. It was a spur-of-the-moment activity. We didn’t even take time to prepare. The hike was hot, and water would have been welcome. Dad and my brother did just fine and climbed up without any stops. Mom and I were a little slower. When we finally turned the corner of the last switchback and could see the Y, it provided the final burst of energy I needed to finish. It didn’t, however, for Mom. She just sat down on the trail in defeat. “Kent, I can see the Y. I’m there. By Christine Fewkes Layton (BS ’96), Fargo, N.D.
During reading days of winter semester my freshman year, a group of us decided we should climb the Y once before going home for the summer. About 11 p.m. we left the dorms and walked to the base of the hill, where a sign said something like, “Caution. Climb at your own risk.” We figured the trail might be too risky and that the right way must be to climb straight up. It took us two hours to climb the face of the mountain, eating each other’s dirt much of the way. By the time we made it to the Y, we were exhausted and dirty and couldn’t understand why people said climbing the Y was fun. Within a few minutes another group of students arrived at the Y from a trail, laughing and having a good time. We decided to try theÂ trail for our return trip. This much easier path ended at the caution sign. We had a great laugh about avoiding so much danger by going straight up. 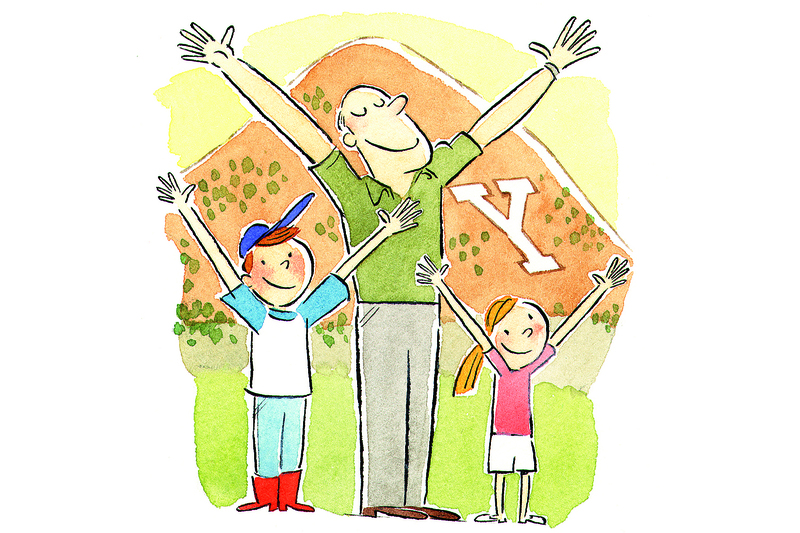 For 100 years the Y on the mountain has played a part in our family history. Being only 94 now, I missed the first six years, but in 1906, a 19-year-old student who would become my mother aided in the original construction of the Y. Fast forward 25 years to when I was one of the 200 or more freshmen who bailed water out of the ditch on the valley floor and delivered it bucket-brigade-style up to the Y. A mixing vat was dragged up to mix the water and lime, which may have been hauled up by packhorse. I worked at BYU, sent me up to assist in selecting a suitable route for a road. Despite a near disaster with a bulldozer and some Forest Service objections to resolve, the road was constructed on university property. Fast forward another 50 years, and my wife’s 100-year-old mother, a devoted and faithful fan of every BYU sport, had the honor of lighting the Y from the stadium during the Homecoming football game. My mother, who helped first build the Y, and my wife’s mother, who participated in a ceremonial lighting nearly 100 years later, have great-great-grandchildren who have hiked there. All of our children and several grandchildren have graduated from BYU. “Stay on the trail” is the advice given at the beginning of the hike. The Y on the mountain is a symbol to our family of staying on the trail, good advice for hiking and life. Read more Y stories online at magazine.byu.edu/y.